Microsoft and Database consultant; Author of seven database books. Carol McCullough-Dieter is a veteran database designer and trainer. 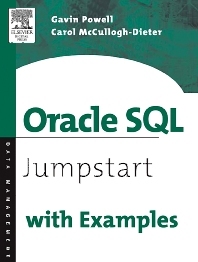 She has written many books on Oracle including Oracle9i Database Administrator: Implementation and Administration. As an independent consultant for federal and state government projects in Wisconsin and Hawaii, she designed and implemented complex, secure, integrated web-based database systems. She has designed in-house and online training guides for Oracle SQL coding and performance tuning.